Its, er, It’s a typo! Ah, these sign makers have taken the good old it’s/its confusion (which is, as we know, near and dear to MRP’s heart) to a whole ‘nother level. Okay, here’s the deal. As a contraction of the words it is, the apostrophe is placed thusly: it’s. 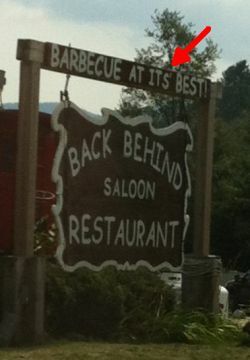 When it’s possession you seek to show, that’s its, as in Barbecue At Its Best! If you find yourself putting the apostrophe after the whole shebang, as in its’, then you need to reevaluate and start all over again. Brians’ Common Errors in English Usage can help, as can The Oatmeal.